Is "vintage" the same as old and worn out? If so, I have tons of "vintage"
married to a sewing machine bottom. and he's developed the perfect patina. "hasn't had a bath in a while". Hope this Picnik "gritty effect"
is hiding the fact that my deck is in need of a paint job in the worst way. But hey, it just wasn't happening this year. So an indoor/outdoor rug from O.Com has helped to hide the neglect. and some of my many watering cans. that constantly need to be watered. "Why do you set yourself up for so much work?" flowers just instantly lift my mood. I have two vintage flower pots full of mint, I'm obsessed with it. It's my favorite to flavor everything from orange juice to club soda. Yummy... and don't forget the lime. Below is a sweet topiary from Mother's Day last year. I wintered it, but it wasn't very happy inside. having a near death experience. It needs to be "whipped into shape"! 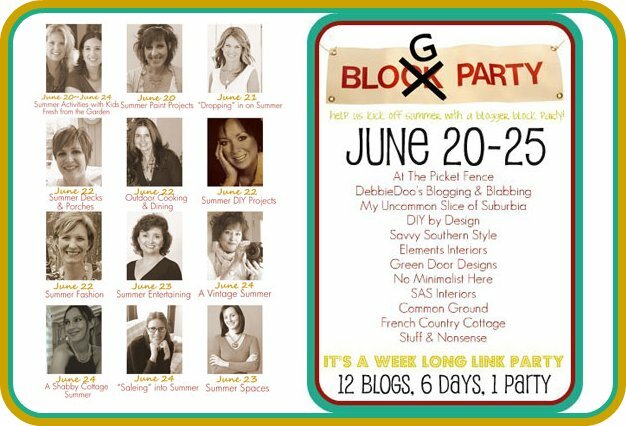 for The Summer Deck and Porch Block Party. for the rest of the links today. for all the Block Party Summer Themed Parties this week. Looks spectacular! I love all the chippiness and bits of rust! Love your deck! I wish I had as much talent as you to decorate everything, you have a great eye for vintage, lovely deck! Such a pretty flowers and items for you to enjoy out there. It is extra work to water the plants almost daily, but I am like you and want to look out at pretty. Debra, everything looks beautiful. 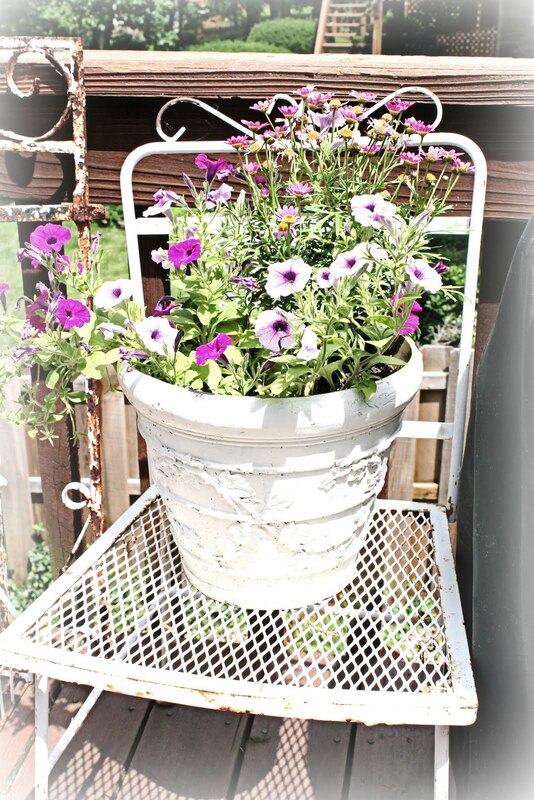 I have 2 concrete urns like you have setting by your iron sewing table, but yours is much prettier considering that you have beautiful flowers in yours. I gave up on trying to have any plants... I just don't seem to have the time to take care of them right now, my son bought me some plants for mothers day, well needless to say their already gone! I did water them for several weeks and then forgot about them.... so for know it's best I don't have any! I'll just enjoy looking at yours!!! TOO much beauty! Deck is just chippy:) and chippy is REALLY "IN" right now! Thanks for showing your stuff to me! Love it all! Have a blessed day dear Debra, HUGS! I really love your outdoor decor. The sewing machine base is perfect to hold all your pretty vintage pieces. I like all your old/vintage stuff....the gates are wonderful. And I agree...color in pots is the best! What an inviting deck! I love everything and don't you dare give that lamb a bath...he's perfect!! I have putting use pots more and more each year, myself, Debra! I find it easier to deal with them than getting down on the ground and dealing with the beds now. I'd rather take the time to water the pots everyday. Like you, I like to look out my kitchen window and see my pretty pots! Plus, you can try out something new or different in a pot and it doesn't become an epic fail if it doesn't take off. Oh, so beautiful pictures. 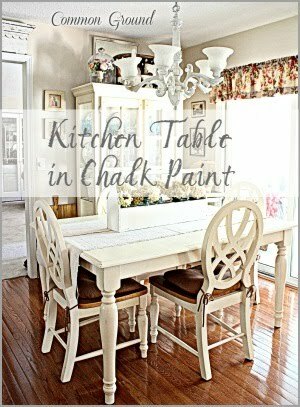 Just love the photo with the table. 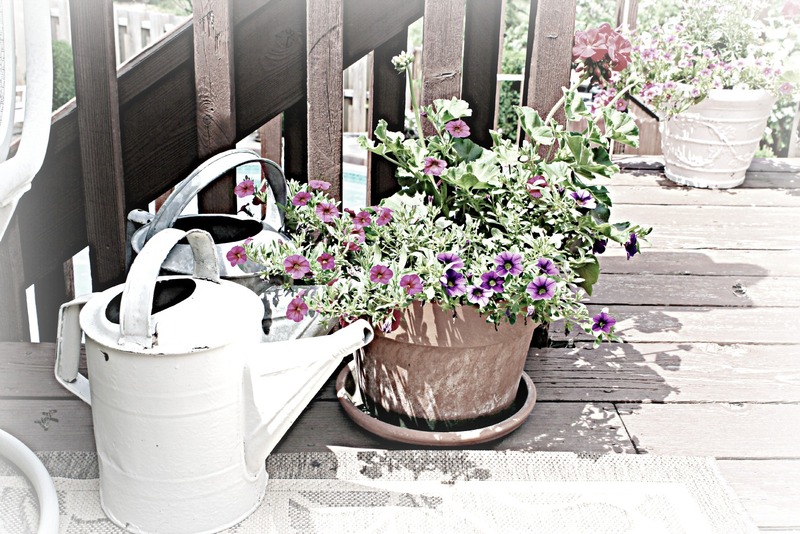 Your vintage porch and yard is so appealing! I love your deck - it is so you. My husband is the same way - but I have to see my flowers and the beauty of our property. Just must! 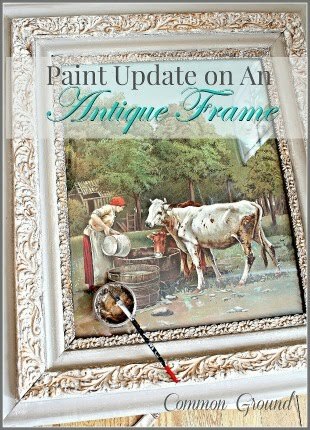 I just love it Debra, in need of paint or not- it looks wonderful, with all your vintage and worn /old lovely things. The table is a dream- with the birdscage ,little house, and your wine. And all the flowers so beautiful--love mint,too, and am just having a cup of pure minttea while writing you, dear Debra. I adore all your warn and chippy white things on the porch. I think your well patina'd lamb is my favorite. It is all just beautiful and so "you". What a pretty space! I love that table. Yes, flowers make everything better. I love to water my stuff in the backyard. Not so much in the front yard. I don't like my neighbors seeing me out there in not my best...but it has to be done. I often do after everyone has gone to bed. I love to garden at night! I'm LOVING the garden gates and fencing!! You've def. given yourself a really pretty area to peek out to every day! How lovely everything is on your deck. The vignette under you kitchen window is delightful. 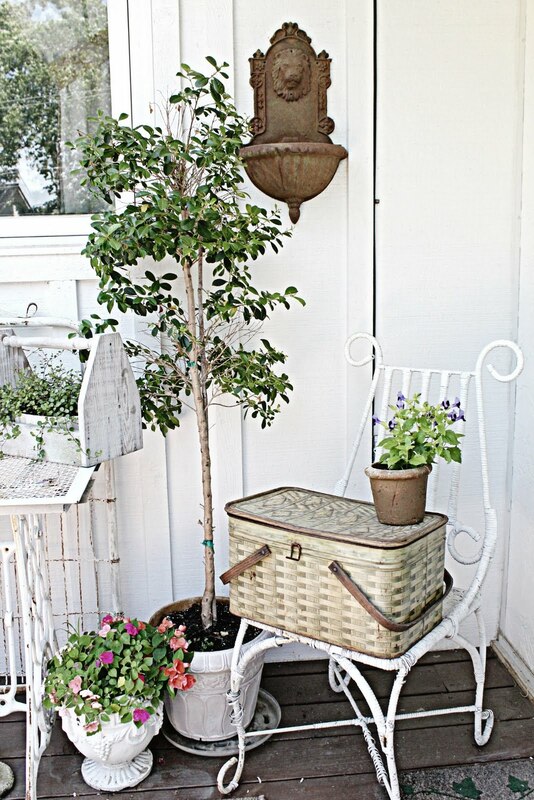 I also love the white wicker chair that has a lyre back with the pic-a-nick basket on it. I should have used that painters technique on my courtyard photos! I guess I will go ahead and thank you early for coming to THT since I'm here! So pretty. I just love that lamb and all the rusty and chippy details. I find myself watering in the morning before work in my pjs to make sure I come home to beautiful flowers. We are off to the beach. Enjoy the party! Everything looks so pretty, Debra. As always, you have an eye for detail and beauty! Your flowers are beautiful and I have to give mint a go! Debra, Your deck is so cute and so many interesting things to look at. Love your little lamb and his "patina". Don't worry about your deck needing painting. NO one even noticed. Painting the deck didn't happen last year for me so I HAD to do it this year. Thank goodness we got it done before summer. Beautiful! 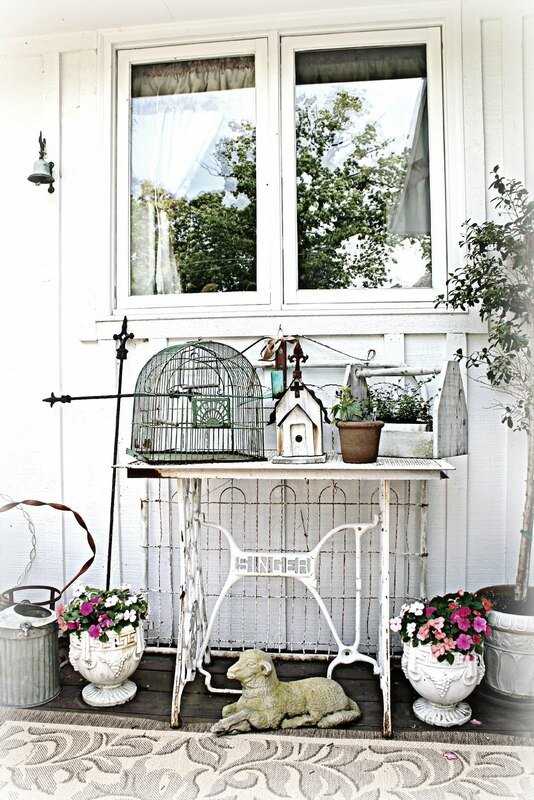 I love all of your vintage accessories, especially the birdcage and birdhouse. Great job! may i sit a spell?? wow...lovely! Your deck is wonderful, Debra! 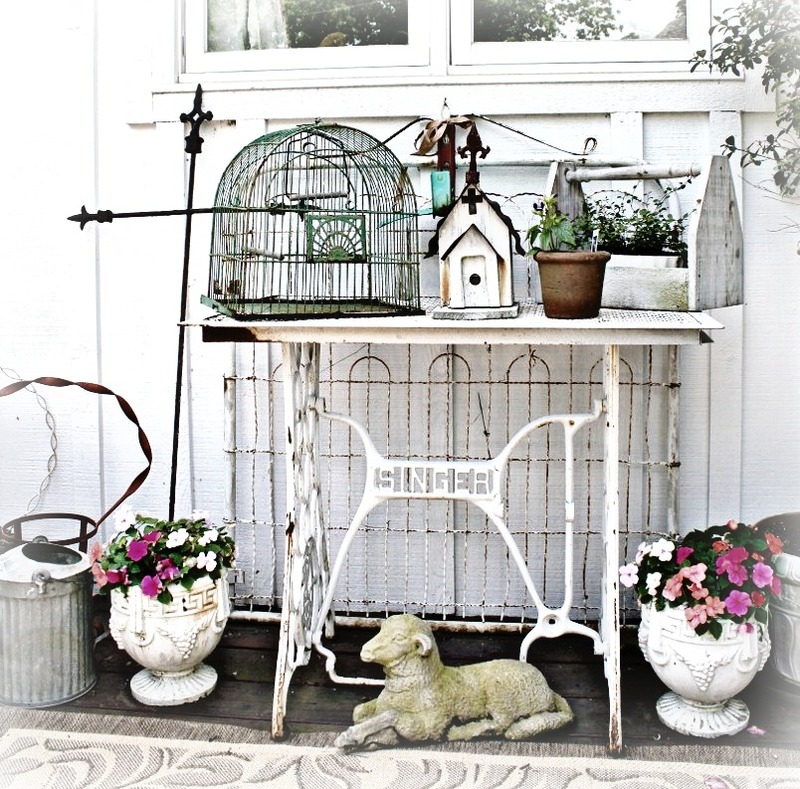 I love all the vintage details you have added and I especially love the cute little lamb. Your deck is beautiful! I love your vintage style! What beauties! I love your deck decor, esp. the birdhouse and the birdcage. Gorgeous! Hi Debra! What a charming and inviting deck! It is so YOU! 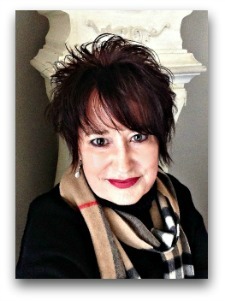 When I saw your thumbnail in the lineup at Faded Charm, I said to myself "that has got to be Debra!" Sure enough! I have a singer sewing table base sitting out in the garden awaiting the right top...and I thank you for the metal grate inspiration! It looks wonderful! I hope you are doing well! 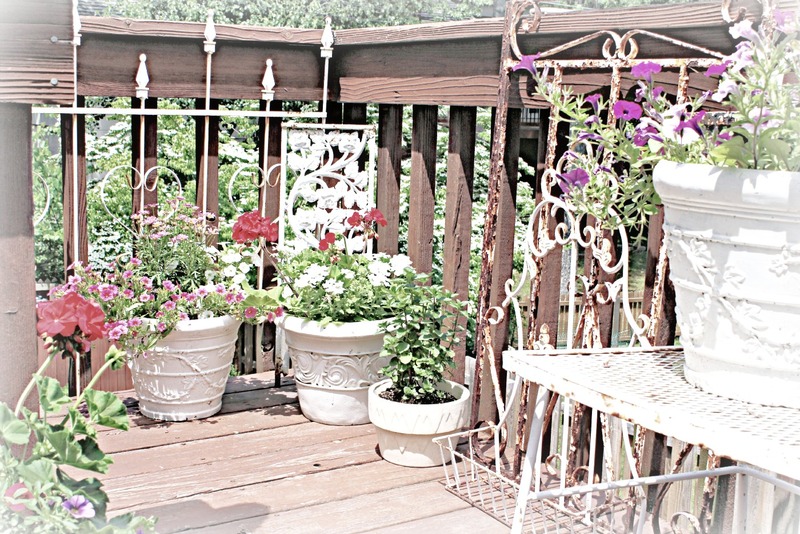 Wow, Debra...just....wow.....your deck really should be in a magazine! I loved seeing your wonderful deck. It was just so much fun seeing how you used your treasures. Just Lovely Debra! So Elegant and Fresh!Love it! Hope you are Doing Well! The People of the Midwest have been in my thoughts and Prayers. Your Weather has Been ...Wow is all I can Say. PS; I LOVE my Necklace! I wear it all of the Time and have received SO Many Compliments! Thank You again so Much for It! Love, love, love it Debra! It looks like it should be in the French countryside. :-) I'm thankful for Picnik too as I was editing my photos! LOL! "one" of your white metal garden gates? No fair! I've been looking for one forever. I need to come up and shop your hood. LOVE your metal garden gate!! 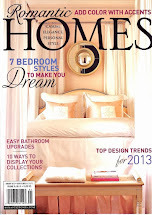 Debra, love your vignettes ! Our deck needs some tlc too and I am with you on the flowers ... I love to look out and see them. 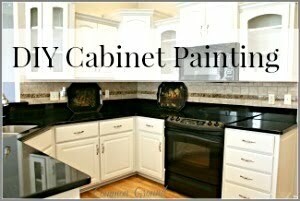 When we first got this old house I removed a window and put in French doors so I could get some light in and see out. OK...we HAVE to do it...we are now singing "Glory, Glory Hallelujah!" repeated several times...gracious Debra...you never cease to blow us away...and by the way, we completely understand that plant thing....we always make sure, that anything we can see out of our kitchen windows looks "happy!" Thank you Debra for your sweet comment. You think I could just come over and hang out on your deck till all this blows over. Maybe I could just hide under one of your pretty planters and make it go away! I appreciate you so much. Wow! What a lot of cool things you have on your deck. The treasures don't come as readily to me but it is always so exciting to find one to bring home. Loved yours. 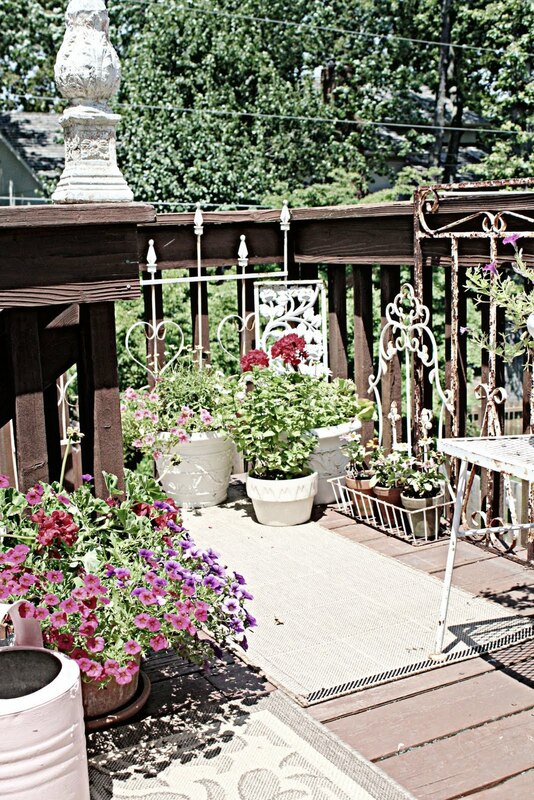 I'd love to come visit you Debra and enjoy a little R&R on your deck! Blogger will not allow me to upload photos today...hope it is all fixed before your party on Friday! So so pretty. Too many flowers. . Never! Yours are lovely. I love your vintage look. What time is tea served? 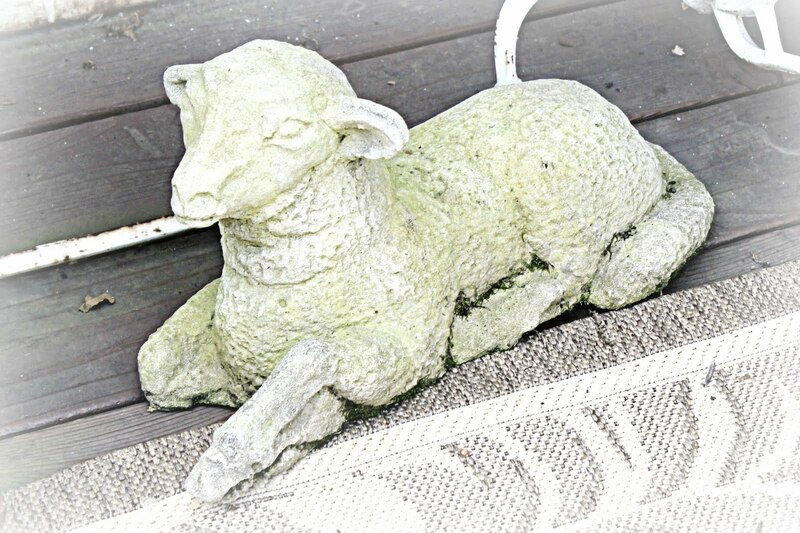 if "vintage" does mean "old and worn out" then consider me *V*I*N*T*A*G*E* I just did a post about moss--I love the lamb! 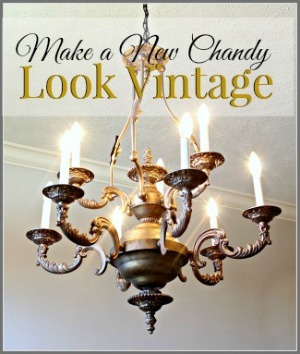 I love your old worn out or vintage things! Love the singer sewing machine. Thanks for sharing. 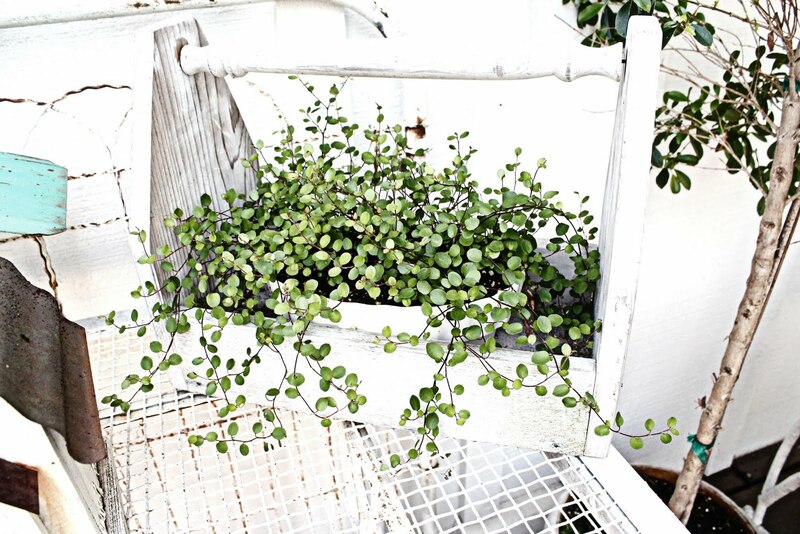 Your white rusty garden fencing is inspiring me. I have bits and pieces of left over kennel fencing that might look a lot better with a coat of spray paint and some random vines. Love how you married the sewing machine bottom and gave it new life. Debra, Your post pretty much knocked my socks off. So much to see and take in all at once...my heart was leaping!! You are so blessed to be surrounded by such beauty. 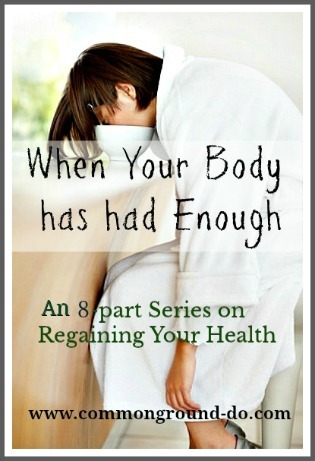 I wanted to tell you I just recently read your health posts and I too will be praying for you. I know you're faith is strong, as is mine and we know that the Lord holds every detail of our lives (large or small) in His very capable hands. How comforting to know that NOTHING is out of His control or beyond His grasp. You are forever safe with Him sweet lady. May He continue to be glorifed through your life and testimony. Love your outdoor space and your wit is killer. I laughed myself silly. I too have a TON of "vintage" items! LOL But I love yours. So beautiful!! I love your lil lion fountain! 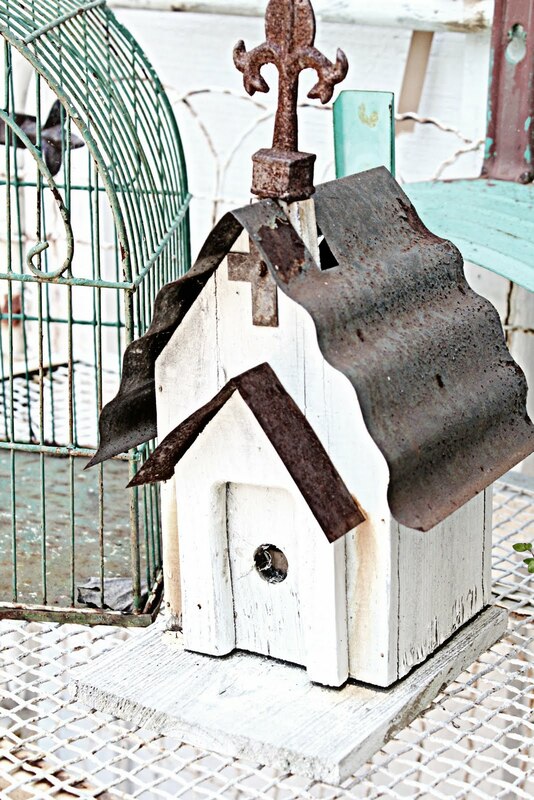 That little church birdhouse with the zinc roof is so sweet!! Love your deck! 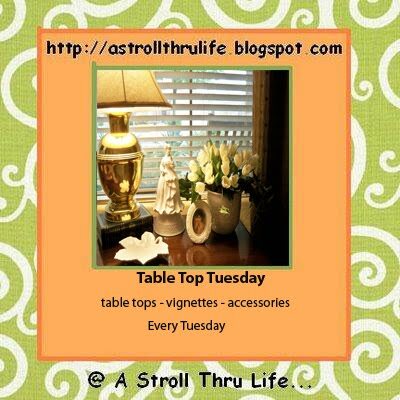 I just had to stop by again to thank you for linking up your beautiful deck this week. Beautiful! 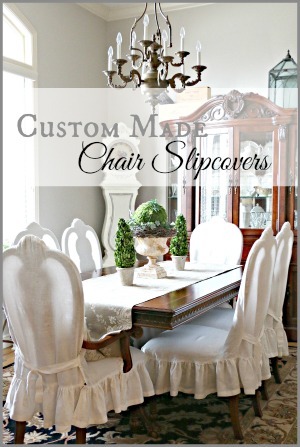 Love all the white especially the white sewing machine bottom! Oh everything looks just lovely!! 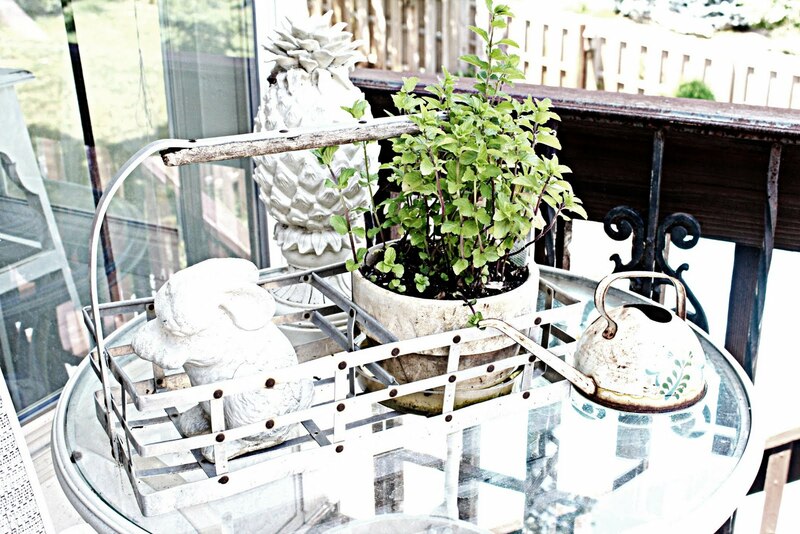 I love how you've taken "uncommon" things and grouped and arranged them into these vignettes! That little lamb is just too adorable! What a wonderful spot with all your beautiful decorations. Love that little lamb. Thanks for linking up to Share the Love Wednesday!